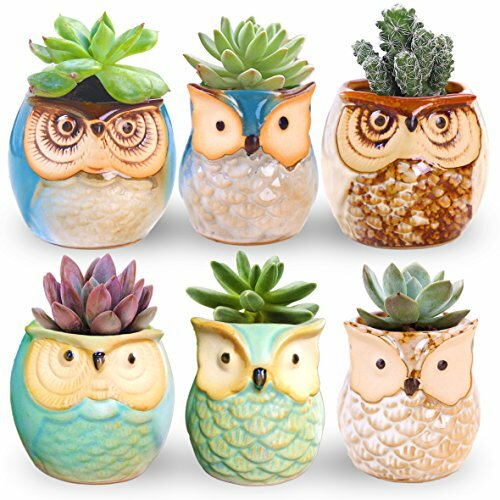 ROSE CREATE 6 Pcs Mini Ceramic Succulent Plant Pots -- Ideal for indoor or outdoor container gardening, this thumb style planter is a tough, lightweight alternative to ceramic planters. This planter offers excellent all-weather durability. Filled with plants, flowers or even candy, these favor pots make an excellent gift. Available in 6 Owl styles. Send your guests off with a small token of your appreciation for sharing your special day. Bring fun to the display of your favorite succulents and other small plants and decorative objects with this lovely small plant pots. * The interior of the pot has a hole at the bottom, which allows for the proper draining of live potted plants. Give this set of small planter pots as thoughtful gifts for family and friends, or keep them in your own home to bring the perfect dash of fun to your living space. If you have any questions about this product by ROSE CREATE, contact us by completing and submitting the form below. If you are looking for a specif part number, please include it with your message.